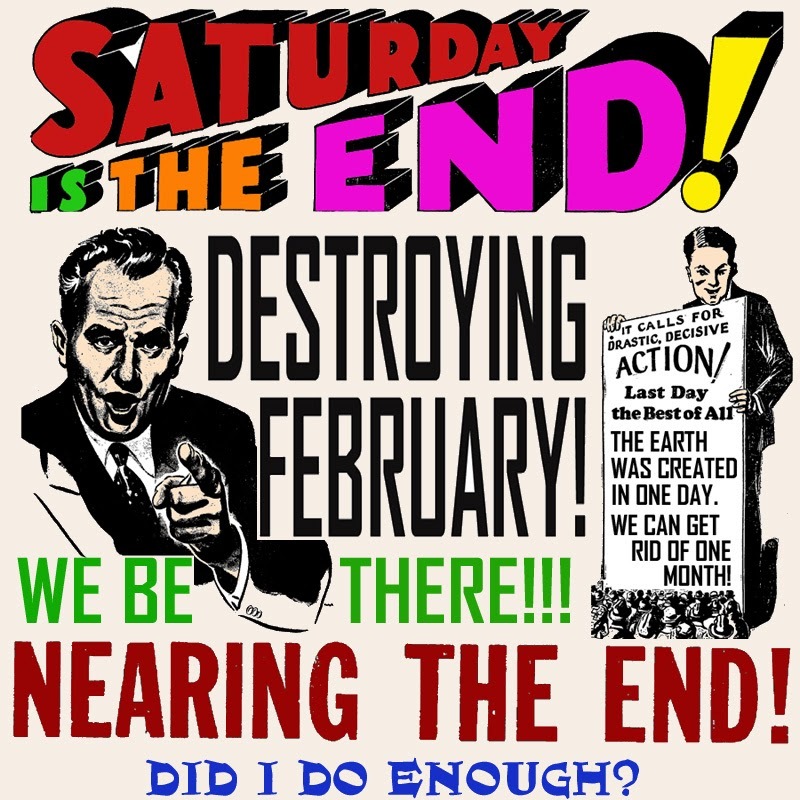 Grandma Slump: Destroying February -- Did I Do Enough? I am given to understand that we are on the verge of a great victory in our interminable month-long struggle to destroy the month of February. Let me be clear, for any who may not understand the gravity of this moment; I don't mean February simply will end for another year; I mean this is literally the end of the calendar as we have known it, as it has included February. That's right. This is the last February any of us will ever see. A major reorganization of time itself will soon be underway! Understandably, I'm flushed with pride that we undertook this great cause, and now are seeing a successful conclusion to the campaign. As I recall, they literally said, "It won't be done, it can't be done." Please note the emphasis on the words won't and can't. That's rich! I'll savor that a good long time! For the old truth is still good as gold: If you set your heart and mind on something -- and go after it with everything you've got, be you madman, be you fool -- it's as good as done. I've proven the adage. If there's any doubt that the deed indeed will be done -- and frankly all that's left is the mopping up -- time will tell. I believe we'll get the confirmation tomorrow, on the last day of February for this year ... and ever. I can't tell you how much I'm longing to see everyone's faces -- especially the doubters and haters (as modern lingo puts it) -- I'll probably pee my pants like a little girl with front row seats to a Menudo concert. Or whoever's popular now. There's a lot moments like that I'm going to enjoy! Talking it over with supporters, they want me to use caution, and not prematurely declare victory. I know, I know, Nervous Nellies are everywhere! Even among my best allies and trusted lieutenants. But look, friends, we've overcome all; what is there to be nervous about? Haven't you seen yourselves the opposition fold like a dime-store napkin? Have you seen even one hint of passion on the other side? If I'd known it'd be so easy, I would've taken out February as a kid. I hated it then, having to hear kids born on Leap Year going, "I'm only four years old!" Sickening stuff. But what if they have a point? We do have the next few days to celebrate in a big way. There's no reason we have to step on the gas and blow out the pipes today. Save some fun for later. Plus, and this is a little lesson I know from my group dynamics research on humiliating people, for any resistance you get from a ne'er-do-well, an enemy, a hater, it's better to lengthen their discomfort, self-recriminations, and disgrace than let it end too soon. Shame is a nasty concoction you want them to sip ... slowly! I can just imagine how I'd feel if I thought February might survive this ordeal. Just saying What if? I'd feel terrible, and I'd be kicking myself, asking, "Did I do enough? Just tell me. Is this on me?" What if, instead of taking time out for myself during the struggle I'd been working harder? It's true, I watch Wheel of Fortune like everyone. And I think, Is this smart? What if it all came down to one more blog post, one more poster, one more meeting at the union hall, one more Februarian beaten to a bloody pulp and left in the alley? From one agitator to another, It's you or me, pal. But I've been going by the domino theory on this deal, and that gives me confidence. You know the domino theory, I hope! (And yes, it's merely a theory; it's never been proven dominoes will fall reliably every time into the future. Until now, though, the domino theory has held up.) You push one over and it has ramifications, consequences. The theory states: "If the next thing, i.e., the domino, or something else that would react as a domino to the prior domino-like thing in a line, is struck by the prior domino-like thing, both will fall." You extrapolate from that, naturally, that the third, fourth items, and on and on, will also fall. By the way, there's a second Domino theory, which is this: "Pizza from Domino's isn't bad, but there's usually a better local option." Obviously, it depends on where you live, so I'm not happy with the word usually. Let us all get a good night's sleep tonight, then with the morning's light I believe we'll be looking at mountains of good news. Then, as the clock ticks ... the pendulum swinging back and forth ... or Felix's eyes going back and forth ... the lifeblood of February will be trickling out an open vein, leaving it finally a cold, hopeless, abandoned corpse. Our deliverance, at last, is at hand!